Usually, when the whole family wants to go out and get away from the tedium and stress of everyday life, they make a reservation at a nice restaurant or go wander around in a park for a couple hours. 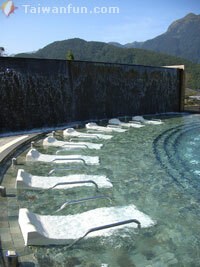 In this issue, however, I'd like to suggest a mini-vacation of sorts at Tienlai Hot Spring Resort. After a day or two of soaking in some nice hot springs, eating great food and appreciating nature, you'll be rejuvenated and once again be ready to face the challenges of the day. This is an account of the experiences of my family and I here as we celebrated my aunt's birthday. When our group went for the day, we were blessed with sunny weather, even though we should have encountered the usual dreary cold of December. After a scenic drive through the mountains, we arrived in Tienlai. 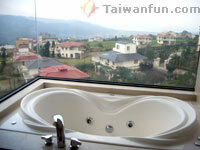 This area is enveloped by Yangmingshan and overlooks the Pacific Ocean--this view alone is worth the trip. After a few picture opportunities, we checked into the resort and found a friendly, professional receptionist and staff. Our rooms were classy and comfortable; in general, the fully-equipped facilities and the fine dining selections here really make this place a great location for a special family event. The entire resort is decorated in a European style; the furniture and decor is leisurely and comfortable, which is also good for families. 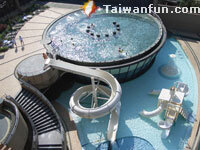 The 600-ping Spa/Water World and the 600-ping hot springs park offers 15 different kinds of hot spring-related games and sports, which certainly kept my younger cousins busy. My mom was excited about their outdoor hot springs lodges and couldn't wait to hop in. As for the birthday girl, she felt the sauna facilities calling to her. Another aunt decided to swim a few laps in their heated pool, as my brother and sister-in-law took a romantic stroll down the sakura flower trail. Last but not least, even my nephew, who is just 13 months old, had a place to go and that was the children's playroom. When dinner time rolled around, a big birthday dinner celebration was on the horizon. The chefs prepared a sumptuous display of dishes that included an abundance of locally grown offerings and seafood. We had a blast trying out all the delicacies here. 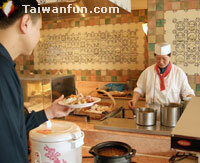 It is worth mentioning that even the buffet breakfast on the second day was as good as a five-star hotel. If you want to try something a bit healthier, they also offer fresh cabbage/carrot and spinach/apple juices. 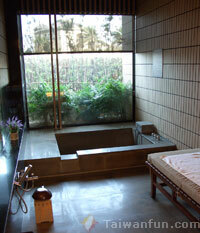 My family really had an unforgettable vacation at Tienlai. If you want some quality time with your family or friends, plan a weekend get away here--you won't be disappointed.